I found this recipe online as I researched whole grain pizza crusts. This was recipe #2 that I tried, and it was the winner! Next time I will try to mix a higher protein flour (like chickpea or brown rice) with a lighter protein content flour (like a whole wheat pastry flour) just to see how it turns out. Pour flour into a large mixing bowl. Add yeast and salt. Mix well. Add water, oil and honey; mix well. Spray with olive oil and cover with plastic wrap and place in a warm spot for 10 minutes to rise. Punch down. Lightly cover pizza pan with cornmeal. Press dough onto pan. 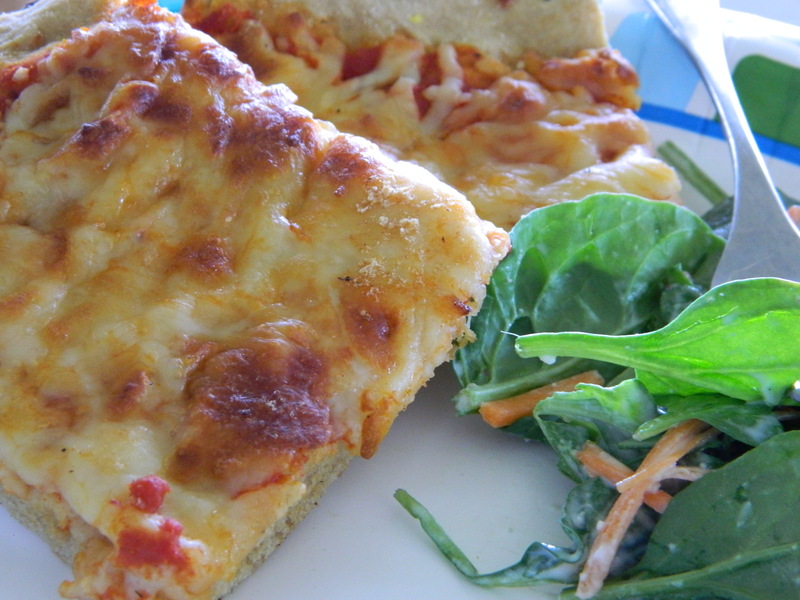 Spread sauce and other ingredients on pizza crust. Bake at 425 degrees for 15 to 20 minutes or until crust is golden brown and cheese is melted.